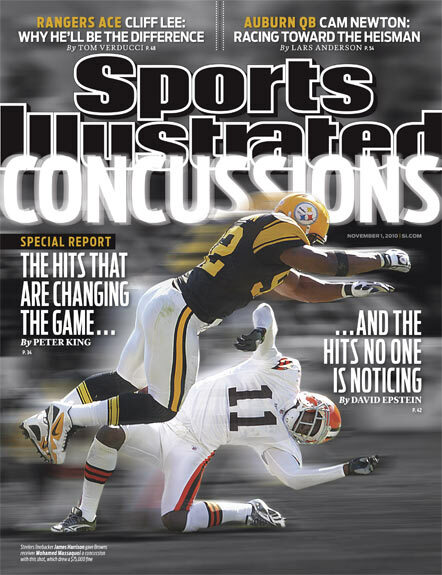 Really interesting content from a Sports Illustrated Special Report on concussions in football... which brought to mind for me some other solid writing on the topic. The lead story was "Concussions: the hits that are changing football" by Peter King and it covered both the impact on life that football-related head trauma can cause as well as the tipping point of sorts brought about by the weekend in football Oct 16-17. Starting with Rutgers player Eric LeGrand getting paralyzed while making a hit and then continuing to a Sunday in the NFL featuring multiple violent head shots and associated injuries... the weekend brought about action from the NFL commissioners office to try to make the game safer. King details this is his story as well as looks at the reaction of players who see the league as going too far in policing physical contact. It was a solid piece and then followed by several other related stories from the same report. 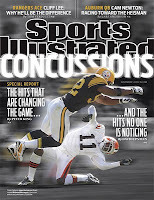 The two that stood out to me related to not the violent concussion-causing hits that the NFL was attempting to curb, but rather less sensational, but perhaps more disturbing idea of kids suffering damage playing youth sports (football in these pieces, but really could be any sport involving contact and potential head trauma). In "The Damage Done", David Epstein wrote of how simply repeated head contact (such as any high school lineman has) can impact brain functioning and the Farrell Evans piece "Early Warning" has mention of cognitive baseline testing in kids so that any trauma suffered can be diagnosed through comparative post injury testing. From this SI report, I thought of other writing on the same two content areas noted above... headshots in the NFL and then in youth football. From an NFL perspective, there's the Malcolm Gladwell (he of best selling Outliers, The Tipping Point, and Blink) New Yorker piece "Offensive Display: How Different are Football and Dogfighting?". Additionally, I came across the interesting Chris Jones Esquire blog post "The NFL's Meathead Chorus Needs to Grow Up" written a week after the new league rules to reduce violent headshots went into effect. So... with all this content noted and linked to, it then begs the question of whether the NFL is taking unnecessary steps? Looking at the YouTube video below of one of the Oct 17 hits that caused all the fuss... I'd say they're on the right track. Going back to the topic of youth football (and all youth sports)... I recall doing this Dec 2009 blog post about San Jose high school football player Matt Blea and his almost dying from a head injury (and not the big hit variety) suffered in a game. It's a dangerous world, but within that... contact sports and particularly football can be a particularly dangerous activity. This doesn't mean that kids should live in a bubble, not play sports or not play football, but a combination of eyes open to the danger and consideration of ways to reduce risk... all things highly in order.